In the 5000m, Carien Kleibeuker(NED) set the bar at 6:56.47 in the second pairing. Despite three others skating personal bests, no one was able to break the seven-minute barrier before Isabelle Weidemann(CAN) and Esmee Visser(NED) stepped on the ice in the fourth of six pairings. But before the 31-year-old nine-time champion got her crack at Visser’s new track record, Natalya Voronina(RUS) had her chance in the penultimate pairing. The 24-year-old long-distance specialist kept Visser’s split times in sight until halfway, but could not keep up with the pace thereafter. With 6:50.39, Voronina still managed to stay under Sáblíková's previous track record, but she eventually had to settle for the bronze medal. 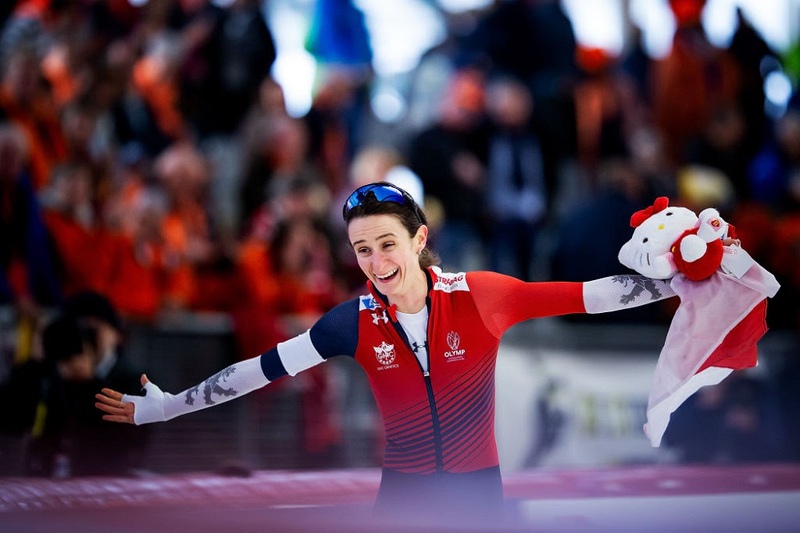 Visser, whose Olympic triumph last year came before she had even won a World Cup medal, said: “I had the feeling that she (Sáblíková) would be able to beat my time, but yes I think it was an advantage for her. It’s different if you have to set the bar without really knowing what’s possible, or if you can focus on a time which you only have to beat by a small margin. She knew she had to skate 32.0 laps the whole race and that’s something I’m also capable of. “Of course I’m a little disappointed, but maybe it’s only good that I don’t win everything at first sight. It keeps me hungry for next season. Brittany Bowe (USA) left the rest of the field far behind in the 1000m, breaking her own track record of 1:14.01 by 0.6 seconds. Before the 2015 world champion entered the rink in the penultimate pairing versus Nao Kodaira, Miho Takagi (JPN) had set the fastest time in 1:14.58. “I wasn’t worried abut that time at all,” 30-year-old Bowe said afterwards, revealing her race plan. “When I’m on the inner (lane) with Nao, one of the fastest openers in the world, I knew I had to open fast but remain within my game plan and not go harder than I normally do, because I have that gas at the end. That fight ended in 1:13.41, the only time to break the 1:14 barrier. Kodaira got caught in the last corner and finished in 1:14.44. In the final pairing Vanessa Herzog managed to edge out the Japanese for the silver medal in 1:14.38. Bowe had been struggling to recover from a concussion over the past two seasons and she was relieved to be back on top. “It feels good, to be able to hear my national anthem on top of that podium, it’s been some time now,” she said. Before Kai Verbij took the ice in the penultimate pairing in the 1000m, his good friend and former teammate Thomas Krol had been the first to skate under 1:08, breaking Kjeld Nuis’s 2018 track record by three-hundredths of a second in 1:07.67. “He scared the hell out of me with that time,” Verbij admitted afterwards. Despite his nerves, the 2017 World Sprint champion managed to keep his composure. “I didn’t use to have a real plan for the 1000m in the past, but now I do. I skated quite a lot of 1000m starting in the inner lane, so I know what to do. I start at 80-90 percent and play safe in the second inner corner. From that moment onwards I attack the outer corners full throttle." The plan worked perfectly and Verbij had enough power left to skate 26.1 in the final lap to finish in 1:07.39. Krol, 26, had mixed feelings at being bettered by his friend. “It’s supercool to be on the podium together, but I’d rather have seen a different order obviously,” he said. After Verbij’s run, Olympic champion Nuis took on Pavel Kulizhnikov (RUS) in the final pairing. The Dutchman had a false start and both skaters had a sloppy race with little mis-strokes. Nuis still managed to clock 1:07.81 for bronze, but Kulizhnikov had to settle for sixth place in 1:08.13. Nuis, 29, insisted the false start had not influenced his race. “No, I had a false start last year at the Olympics and I skated the race of my life, and today my opening was good too,” he said. “I was focused on my opponent too much, instead of on my own technique. We both skated a jerky race and I’m really gutted. But all credit to Kai: he skated a fantastic race." Jorrit Bergsma took his third 10,000m world title in the day’s final event, edging out compatriot Patrick Roest by four-tenths of a second, while Danila Semerikov (RUS) pushed home favorite Patrick Beckert (GER) off the podium by a 0.002 margin. Beckert had skated 12:57.40 in the penultimate pairing and, with only Roest and Semerikov to go, he was in silver medal position. Bergsma was in the lead with 12:52.92. Roest attacked Bergsma’s time straight from the start and he got a small lead over his compatriot in the split times until the sixth of 25 laps. He gradually lost time in the rest of the race and with two laps to go the World Allround champion was almost three seconds down on Bergsma. Heading into the final lap, the deficit on Bergsma was still more than two seconds and Semerikov was more than two seconds behind Roest. Roest accelerated to skate a 29.8 final lap, giving Bergsma quite a scare but finishing in 12:53.34.